Mark Davis is a fairly common name. But then again…see updates. It appears that the Raiders owner might actually own thousands of domain names, some of the unsavory. News broke today that the Oakland Raiders had enough votes to move the team to Las Vegas, and people quickly picked up on the fact that LasVegasRaiders.com was registered. It was registered in 1998 to Mark Davis, which happens to be the name of the owner of the Raiders team. But there might be an incredible coincidence here. The Mark Davis that owns LasVegasRaiders.com might not be the same Mark Davis that owns the team. If you look at the whois record, you’ll see an exposed record that shows a house in Alamo, California. It’s a modest house according to Zillow. If you search for the phone number you’ll see some businesses listed under the name. According to DomainIQ, the email address is associated with over 3,000 domain names. 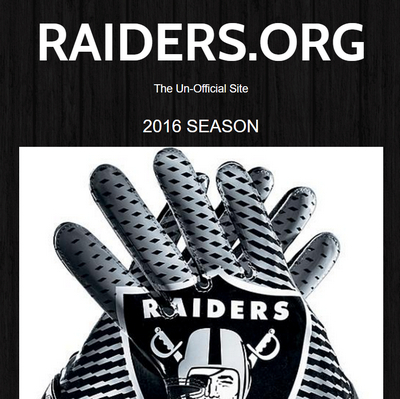 I don’t think the Raiders owner is messing around with an unofficial fan site in his spare time. Among the other domains owned by this Mark Davis are 411Escort.com, 800Playmates.org and SexualityOn.org. A bunch of other domains are related to other NFL teams. So, unless the owner of the Raiders is a closet domain investor who lives in a modest home for someone worth $500 million, then I think this domain name belongs to a different Mark Davis. I emailed and called the information in whois today but have not heard back. Here’s a photo of the one he owns. I see some slight discrepancies, but it does seem like too much of a coincidence, doesn’t it? The post Did Raiders owner register LasVegasRaiders.com in 1998? Not so fast. appeared first on Domain Name Wire | Domain Name News & Views.